Happy New Year! Or maybe not so happy. 2018 has begun, and it has already brought some powerful games criticism that puts playful interactive media in dialogue with decline, decay, and the death of civilisations. Lighting up the darkness are examinations of meditative practices and visions of a life beyond oppressive social norms. 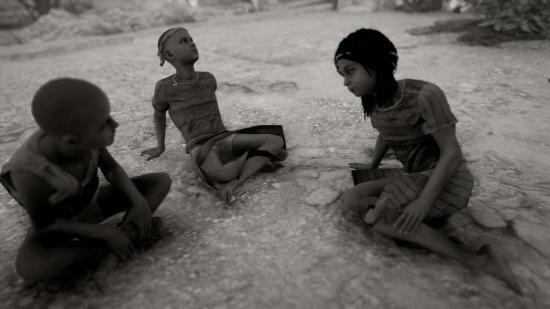 In-game photograph from Assassin’s Creed: Origins, by Dia Lacina – see link below. Two writers address how game designs put players into different visual modes, and thereby change the whole nature of play. Dia Lacina theorises player agency and power in the practice of video game photography. Christian Donlan observes that some technologies are better suited to installation art than home consumer electronics – but it’s impossible for corporations to keep a product alive if it doesn’t have a mass audience. These four fascinating pieces of writing look at the impact of games on mental health and how they portray mental illness. Jay Castello gives an overview of games that portray meditation, and games that facilitate it, comparing contemporary myths about mindfulness to new ways of practising it. Cecilia D’Anastasio interviews psychiatrists to make sense of why gaming disorder is a problematic way of thinking about problem gaming. Satan himself, borrowing the pen of Jamie Madigan, summarises the psychological tropes that loot boxes are designed to exploit. Leonardo Da Sidci highlights the way the protagonist’s delusions are portrayed as not only frightening, but also such an intrinsic part of her and the player’s experience – sometimes even a helpful part of it – that they cannot be easily eradicated. Queer theory has a strong impact on two pieces published recently, that both address how media and storytelling affect the norms that guide our society and determine who fits in and who is left out. Jon Sorce reads this game’s portrayal of robots reconstructing human society, through an understanding of gendered modes of expression as not innate, but constructed. (Content warning: transphobia, transmisogyny, intimate partner violence, murder) Carol Grant gives a thorough summary of Atlus’s transphobic storylines, explains the assumptions on which they operate, and demonstrates why it matters. Unsurprisingly, there is a growing sense of decay and collapse after reaching the end of 2017; these writers reflect on how that has come out in game design. Kate Cox argues that by playing as the “mayor of nothing” we finally confront the empty reality of millennial capitalism, and calls for games that can help us to imagine an alternative. Khee Hoon Chan addresses the millennial loss of purpose via nostalgic superflat glitch aesthetics in this mid-development title. Three critics highlight games that challenge received genre conventions relating to zombies and the apocalypse. David Shimomura encapsulates an elegant design that breathes new life into tired zombie tropes. Edwin Evans-Thirlwell compares dystopian futures in AAA and fringe indie alike. Cameron Kunzelman highlights a queer approach to the apocalypse portrayed in These Four Walls Called Reality. Eric Swain completed the mammoth task of rounding up 2017’s games discourse last week – be sure to check it out! Taylor Hidalgo has announced the theme of the next Blogs of the Round Table – write something based on this prompt and submit it through Twitter or email to be included in the next monthly BoRT roundup.